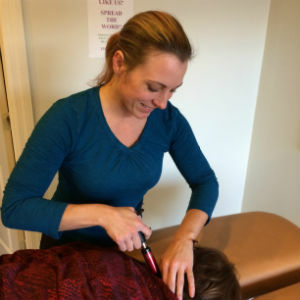 In our office, patients can experience a variety of safe and gentle techniques that promote healing and health. The Activator is gentle and safe for everyone. For those patients who want to know what the Activator feels like before actually getting an adjustment, Dr. Barnett will use the Activator on their hand to show a patient just how gentle it is. She shows her patients everything she is going to do so patients feel completely comfortable. Cold Laser is a painless light wave that increases the self-healing of your cells. When the light photons are absorbed by the cell’s mitochondria, increased production of “cell energy” called ATP happens. With increased energy from the laser, and increased electrical activity from adjustments, cells can repair and replace themselves faster. Faster cell repair means faster healing from injury (old or new), surgery and many other conditions. If you’re ready to experience healing and health in your life, call (770) 971-8115 today!